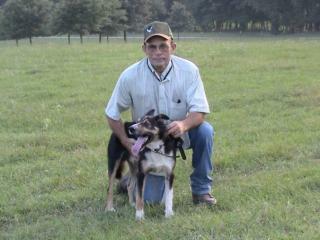 We have been training and selling border collies for over 30 years. Our first border collie, Billie, was the beginning of a new activity at our place. Lynn had trained and worked with several other breeds of dogs, but Billie brought the training aspect to a new level. After only a few weeks of training, Lynn realized what a wonderful breed of dog. He was the most trainable dog he had ever worked with. Needless to say, Billie became our #1 helper on the place (which demoted me and I am thankful for my blessings!). When Lynn was riding cutting horses, our children were his turn-back help. After they left for college, I was promoted to the position. (I never claimed I could ride a cutting horse!) But I was the pitcher on our softball team so after a few fiascos on the horse I chose to stay on the ground and pitch rocks at the cattle to move them better. We have recently moved to the Southeastern part of Oklahoma near Atoka. Lynn and I both grew up in this area. We decided this would be a good place to retire. We built our dream home and Lynn's dream kennel. And it doesn't hurt that we are a lot closer to both our children and grandchildren! Since we have moved back to this area we compete in a lot of cattle trials. We are still competing at the Oklahoma State Fair, Tulsa State Fair, and Fort Worth Stock Show. We put on many demonstrations for different organizations. We have worked the Tulsa Scottish Games for over 10 years. We supply sheep and show the dogs working at the rodeos for the mutton bust'in. It is an opportunity to show the many talents of the Border Collie. We felt honored recently to have a person from a university approach us about writing an article on border collies and how they can be used in farming and ranching. They had said that this will appear and be used in the Introduction to Agriculture I: Agriculture Education, published by CIMC. In other words, it was to be used in first-year Ag education for FFA. It is now in print and will be used for seven years in the schools. With everything going on this past year, with building our home, the kennel, and just all the work involved, we had forgotten about the book. One day, we got a call from our eldest grandson, and he said, Pa, you aren't going to believe this, but you and Grandma are in my Ag book. We had forgotten to remind him that he might be using this book in his Ag class. We all had a nice laugh!